Warmest cycling gloves I've found! Definitely warm, down to at least mid-40's F and probably below that, yet with the dexterity needed to work the brakes and shifters. I have some XC skiing gloves which are very warm but too clumsy for cycling. And mittens, which would be even warmer, offer even less dexterity. Be aware that insulated gloves like these can't work on touch screens. I use these gloves for cold weather road cycling. I thought they would be a little warmer than they are but overall I am happy with them. My fingers get a little cold when the temps get close to freezing and riding at a moderate pace. They gloves should be fine for just below freezing if you are riding hard and exerting yourself. For me, I consider the temperature range on these gloves from 32f to 45 for normal riding. These gloves are really comfortable and have good grip. The velcro cuff is nice as well. I dinged them one star for not being warm enough. These were a Christmas gift from my kids this year. 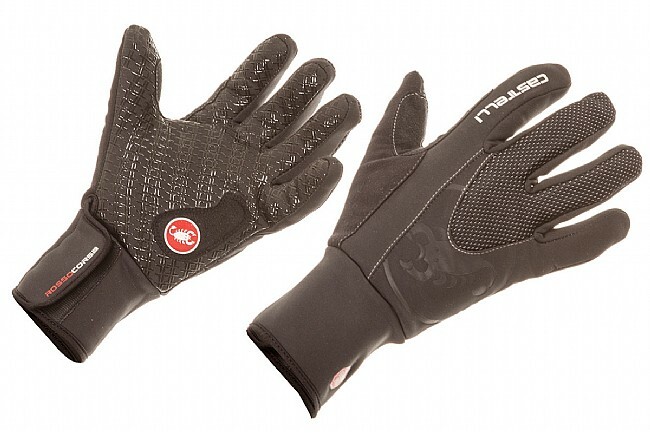 They were a very welcome upgrade from my previous winter gloves, the Castelli Chiros. The Chiros still serve me well from 40 - 50ish degrees, but the Estremos have been a necessary addition when the temp drops below 40. They are super comfortable. Great feel. Cozy warm. Perfect fit. I can't yet vouch for how water proof they are on extended rides in a steady rain. Still, my hands have been dry and warm in light, intermittent rain with temps around 40. In dry weather, I've used them down to 30 degrees. I wouldn't say my hands were toasty, but I was comfortable enough. I wear the gloves in extremely frigid temperatures to work out in outside and also when riding my bicycle in freezing conditions. They keep my hands warm still some tingle at end of fingers. Have used them in the 20's they did okay. Today temp was in the low 30's and they kept my hands warm. They are better then PI lobster gloves. I also own Planet Bike Borealis lobster gloves and they keep my hands warm. Have on order from Dicks store a pair of Seirus Heatwave Liner gloves. Still looking for the perfect glove. I'm super-impressed by these gloves. They have not only kept my hands warm on rides around the freezing level, but literally sweating. Even when my toes have been numb, my fingers are toasty. I don't think you'd want to ride in them much above 45 or 50, but for those cold rides, they are perfect. As others have said, order a size or two above what you think I have average to small hands, and large fits pretty snugly. I was worried at first about the tight fit and heat loss, but that has NOT been a problem. The fingers are a little bulky, but if want to be warm, it's a small price to pay. Hugely recommend! They hold the heat in 35 degrees....wind chill probably 25. They are a bit bulky but definitely sufficient for touching brake and shifting controls. Worth the trade off for comfort and warmth. These gloves are perfect. Not too hot, but very warm on the freezing mornings. Easy on and off.best winter gloves I have had. If I had a nickle for every pair of gloves I've purchased I'd be rich! I struggle finding full-fingered gloves that fit - sometimes the fingers in the womens gloves aren't long enough. And I struggle finding gloves that keep my hands warm in the 30-40 deg temps (I have heated gloves for colder than 30 deg). I was wearing a pair of Castelli Womens cw 4.0 Donna gloves however they're no longer being made. The gloves fit, well, like a glove. Castelli tends to run small so in a womens glove I order a large. And sometimes in womens gloves they're wimpy, as if women won't ride when it's cold so sometimes I'll order mens gloves. Based on the sizing charts and comments that the Estremo gloves run small, along with Castelli's trend to run small, I decided to go with a mens medium and the fit was perfect. However, there were a couple of features I didn't care for, hence, only a 3-star rating. The finger length is spot on however there's probably a 12 of insulation at the fingertip ends so getting that finger feel is missing. It's also awkward getting them closed at the wrist and underneath the jacket cuff. The cuff is a very tight fit so not much if anything fits underneath it. Plus the loftiness at the end of the fingertips makes for a time-consuming closure. The gloves are warm, no doubt, and I do plan to wear them but they won't be my go-to when the temps are in the mid-30s. Very good quality. Stay dry and warm in rain and cold wind - but does not sweat too much. one thing I do not like, it could had at least one fingertip coated with silicone for touchscreen GPS controls. I've used these gloves on several 90 minute rides with temperatures in the upper 20s to mid-30s and they have kept my hands completely warm with not a hint of finger-tingle. When I return from my ride I find that my hands are actually a bit sweaty, but this has not caused any issues on the bike. The palm padding is very comfortable on the bars or on the hoods and there is good flexibility in the body of the glove. It takes a little getting used to the finger feel when shifting gears - but this would be true with any insulated glove. Gripper surfaces provide a secure feel and the back of the gloves are soft enough to take care of the inevitable cold weather nose wiping duties. Great Castelli style is a bonus to the performance features. I haven't tested them for water resistance, but I'm considering using these as my downhill ski gloves. My only slight criticism is that the thickness of the Velcro closure at the wrist can make it difficult to get elasticized jacket sleeves over them. Not a deal breaker - just need to spend a moment fiddling with your clothes to get the proper fit. Comfortable down to the low thirties I'd say. Water resistant and perfect for PDX winter riding. I bought this gloves based on the good reviews and some friend expertise. I didn't have the chance to tried them on rides below 30 degrees, so may be a little earlier to give a good review. I can say that they keep my fingers warm and the silicone palm provides a good grip. So if your looking for a pair of winter gloves, Castelli Estremo are one of the best choices. ...for wet temperatures in high 30's or low 40's degrees. Hands stayed dry but wish they were warmer. I guess that's the trade off with more dexterity in the fingers. They fit perfectly and are good from the mid-thirties through the forties. Not good for me in cooler temps. It would be nice if the cuffs were larger so that the jacket sleeves could be tucked in but, they work. I use this gloves when temperature is 38 degrees up to 50 degrees while riding my bike.